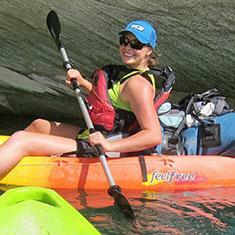 A native to Oregon Emily moved to Bend in 2007 pursue a nursing education and outdoor fun. She first earned a certificate in massage therapy and then completed a Bachelor’s of Science degree from the University of Oregon through the Cascades Campus in 2011. While pursing her degree she worked as an aide and massage therapist at multiple physical therapy clinics around Bend. She enjoyed helping people recover from their injuries and was greatly inspired by the physical therapists she worked with. These experiences were pivotal in making the decision to pursue further education in rehabilitation. In 2013, Emily moved to sunny Arizona to attend Northern Arizona University where she graduated with a Doctorate in Physical Therapy in 2016. Emily has a strong interest in rehabbing general orthopedic injuries, pelvic floor issues, and helping the post-natal mama safely return to her prior level of activity. The core of her women’s health training is through the Herman & Wallace Institute in addition to extensive mentorship and self-study. She is passionate about helping those with incontinence, pelvic pain, and prolapse. Emily enjoys working collaboratively with her patients and uses a combination of manual therapy and therapeutic exercise to get things moving and feeling better. In her free time, Emily enjoys spending time with her husband Ryan and daughter Anna. Together, they enjoy seeking adventure on the trails, lakes, and rivers of central Oregon.